JPC Tuff Rider Turnout sheets. JPC Tuff Rider Turnouts -- Ride 'N' Go ! The JPC Tuff Rider waterproof breathable turnout sheet for your horse or pony is made of a durable 600 denier rip stop 100% polyester chocolate and pink plaid. 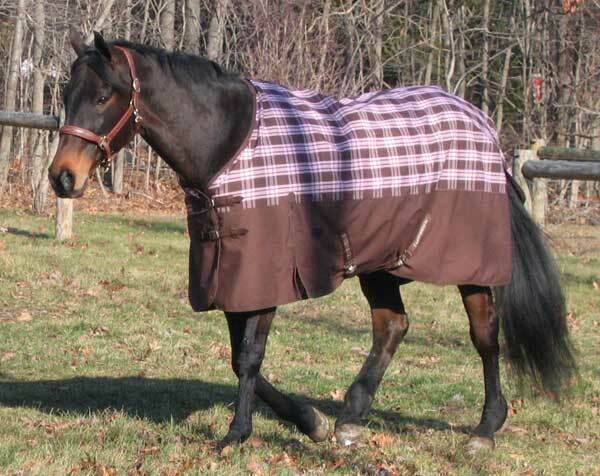 The nylon lining at the shoulders prevents rubbing, and across the bottom repels mud, hay and shavings. A high gusset offers freedom of movement and the aqua bloc taped seams ensure leak proof performance. MVT 4,000 grams - Allows 4,000 grams of moisture vapor to pass thru 1 square meter of fabric per 24 hours. The smaller sizes are truly pony sized. The removeable tail flap is pretty cool. It makes it very easy to just wash the tail flap. Lining: Breathable nylon lining inside the shoulders with a 3/4 mesh lining..
Tail Flap:Removable tail flap that's easy to wash.
Color: Beautiful Chocolate and Pink Plaid on the top and solid Chocolate Brown on the bottom.